Business owners have something to be thankful for. American Express offers its best business credit card that can help both retailers and service providers. With the Plum Card, retailers can now enjoy unlimited spending on supplies and an extended due date to pay off their balance. Retailers may often find themselves floating the cost of supplies and services for a period of time before the customers get them paid. This is the time when their investment gets the returns as expected. The Plum card is designed to provide business owners the time they need, because it understands how cash flow in the business works. This being said, the Plum card allows the cardholder to pay the balance for up to 2 months – without any interest fees. However, they do require a 10% downpayment of the total amount beforehand. And if you’re able to pay the full balance within 10 days from the closing of your statement cycle, you get to enjoy a 1.5% discount. Another business advantage of the Plum card is that there is no pre-set spending limit. But this does not mean unlimited spending. Instead, your purchasing power is still parallel to your credit history, financial resources, and the use of your card. Other factors deemed important by the company can also be considered as well. American Express Plum card has also partnered with several companies that may be of use to your business needs. As such, exclusive discounts of 3% or up to 5% can be yours whenever purchases are made. These partners include FedEx and Hertz companies among others. For the first year of use, you get to enjoy 0% annual fee. This is then increase to $185 every year thereafter. The fee for foreign transactions is at a fixed 2.7% of the amount after conversion to US dollars. For late payments of more than 60 days, the interest fee is at 1.5%, which is then increased to 2.99% of the previous amount due. Returned payments also incur a penalty of $35. Bill payments can be managed by an authorized account agent or manager, provided that the individual is at least 18 years of age or older. American Express truly knows how to celebrate the community impact of service providers and retailers. Doing business has never been this convenient. Not all credit cards are created equal. And not all credit cards possess the ultimate buying power of money. This is certainly true for the Visa Black Card. Widely known as one of the most prestigious – if not mysterious – credit cards around the world, the Visa Black card offers very exclusive benefits to the owner. 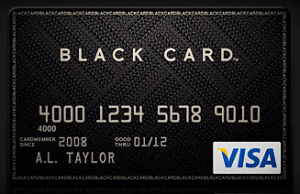 The Visa Black Card caters to those people with higher levels of income, higher credit rating, and higher spending. It’s pretty clear that membership isn’t for everyone. This rarely seen, but easily recognized elite card is rumored to have members of only 1% of the American population. Getting the Visa Black card may be costly but it does offer amazing perks. As a card member, you get to book a vacation, rent a vehicle, or purchase household and personal items with just one swipe. But take note – since this card is for the elite, affiliated companies come from the elite as well. With great purchasing power comes great responsibility. But worry not. This card offers zero accountability, which means that no liability will be made for any purchases made by someone other than the cardholder. It’s this kind of service that can put your mind at ease and your wallet far from empty. One of the best features of this card is its 24-hour concierge. At any time of the day, you can ask assistance for restaurant and hotel information, reservations, gift arrangements, and most desirably, purchase of hard-to-find and exclusive items. Whether it may be the first publication of the next JK Rowling novel, or a rare Picasso painting, this service helps you out. And the perks just keep coming. For an event of trip cancellation or interruption, a reimbursement of $1,500 will be given to the cardholders. Black card can also insure your baggages for up to $3,000 during any trip in cases where the baggage is lost or stolen. In cases of baggage delay, a reimbursement of $500 will help wipe that frown on your face. The Visa Black card also covers your medical and legal services whether you’re out on a business trip, or you’re chilling on the shores of Hawaii. Other penalties and fees can be seen at their official website. If you’re thinking of getting into this exclusive circle of elite privileges, then you might want to start building up a good credit history. After this, it won’t be long before you receive an invitation to enter the world of the Black Visa Credit Card.